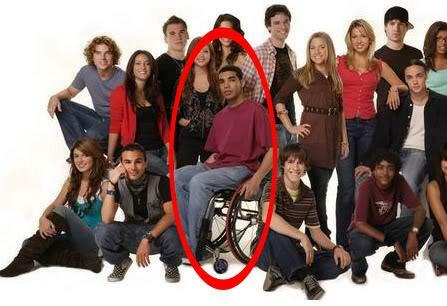 that girl in the wheelchair: Glee, let Degrassi go there. Sometimes if I miss a few episodes of a show, I get out of habit so lose interest in it altogether. [Tangent: Like I was obsessed with the first two seasons of Lost, then my college art classes started being scheduled on Wednesday nights and this was before DVRs (I'm old) so they just didn't get watched. True- Lost is one of those shows you just can't miss an episode of or you will have no idea what who someone is or what those numbers mean, but this happens with other shows too as you will see. ] I'm not entirely sure when this descent into "I don't give an eff" happened with Glee. Trust that I am not too hip to admit that I am above watching the Cop Rock of the 2000's...or ahem...downloading all the music....or at least I was. yeah...my iTunes has some dark secrets. Anyway, either by sloth or curiosity, [Tangent: Or maybe the fact that they covered Extreme's More than Words early in the show. That will hook me EVERYTIME!] I happened to watch last weeks episode- the now very controversial school shooting episode (you can read about it here if you didn't catch it.) So apparently, my disinterest in finding the remote control to flip the station came on a good day. First off, I have read a lot of the press and I kind of agree, it was pretty damned insincere and, call me crazy, but I don't look to a musical comedy to be the beacon of insight into tough topical issues. [Tangent: Also they touched on Catfishing and gun control. Don't worry.] I can definitely see how the Sandy Hook parents had a negative reaction. The whole story seemed super slapped together and then, SPOILER ALERT: There was no school shooting. Sue's gun just went off. So the whole concept of school violence was played for tension. If I am gonna look for teen shows that "Go There", I will watch Degrassi. [Tangent: Yep, cats out of the bag. I am 30, and have been a Degrassi fan for a number of years. It's not even a dark secret at this point, I think its a fantastic show and I know what to expect because it's tagline is literally "Degrassi: It Goes There." I can sense your judgement, but seriously LOOK INTO IT!] Don't you remember when Degrassi did a school shooting episode? It wasn't patronizing and it was intense. So what am I getting at? I have no idea. I have basicallyly just revealed to all of you people how inherently lame I am. Or maybe, it will get some of you other old folks to check out Degrassi: The Next Generation and be loud and proud about it! You will see everything from high crimes to throat gonorrhea delved into...and there are killer Canadian accents. Kimmie, I'm even older than you and used to watch the original 1980s DeGrassi, which was AWE-SOME! Google "spike degrassi," and check out the amazing gigantic hair, if you don't believe me. The show convinced me my teen years were going to be fraught with difficulties and possibly pregnancy (like Spike's). Didn't happen. Spike is on the next generation and her daughter Emma is a student!!! Yes, I remember the original vaguely. I've never watched Glee but now I kind of want to just to see how wrong and lame that "the gun went off" episode was. Oh..ho..ho...You think that YOU'RE old? I'm so old that I remember the *original* version of Degrassi. Also so old that I'm too senile to remember if they covered hard-hitting issues or not. I think that Glee should just stick to entertaining people. We all have enough bombardment of the horrible things in this world on a daily basis and would it be the end of the world for them to just sing their little songbird hearts out and entertain some folks and let them forget about the bad stuff for a while? I remember the 80s one...and many of those characters appear in the next generation...as parents. Snake is a teacher! p.s. Thanks to this post, I just went back into the delightful 80's by way of Degrassi Junior High and recalled that yes, they did indeed cover important issues. I remembered watching the episode of Spike getting pregnant back in the day but I did not remember that pregnancy tests used to take an hour to get results. I was also shocked to see that teenagers weren't smart enough to hide such tests from their Moms! I mean...duh! I also learned that "hickies are gross" and that "girls can't say no if you give them flowers". I need to go back and watch some of those Degrassi Junior High episodes to get the backstory.